But mostly because we have just plain been busy enjoying life! And enjoying it to it's fullest! I can not seem to give up this crazy notion that I somehow need to "catch up". At this point, I know that is not realistic, so I am going to try to just jump in. Because where we ARE is a good place to be. Today I am preparing for a Family Christmas Party, here at our home. Tonight I will see Aunts, Uncles and Cousins I have dearly missed. my gratitude for where we ARE overflows. I have six beloved stockings hanging from my mantle. Santa will fill ALL of them in just a few short days. open the gifts we have so carefully selected for one another. I feel as if I might burst. waiting for me to find the time to finish addressing the envelopes. I will get to them... I will. For now, I am content to read "The Santa Claus Book"to 4 rowdy little sets of eager ears... Again. They are darling, by the way. I can not wait to finish sending them. The front is a surprise. A new, current family portrait adorns the back. I gush with gratitude that we are ALL together to have it taken. To preserve the memory of the year that changed us... FOREVER. We are still standing... Together. And this might just be my favorite image in all the world today. There are 4 very sweet faces smiling up at me from the bottom of the card. ALL of them growing, learning, thriving. HERE. Yes, HERE is a good place to be. Listening to Christmas tunes caroling out through our intercom. Watching the snow fall through the fog outside. In our jammies, making soup to serve to those we love. Who will be here to see us and visit in just a few short hours. ...Guess I better go shower! I am so happy you finally posted!!! My sister said she saw you the other day at Cosco! Well anyways, you don't know me, but somehow I feel like I know you! I'm so happy that you do get to fill all your stockings! Have a very merry Christmas!! I, too, have followed your Amazing Story. You have been an inspiration! 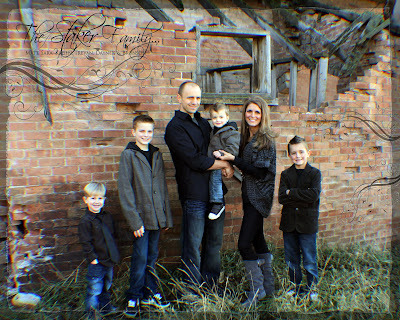 Sara - I have waited so long for an update of your family! Wonderful to see those beautiful boys - all bright-eyed and handsome as ever! Miracles are abounding... my cousin Cheri delivered her 9th baby last month. After a very difficult delivery, little Daxton had a severe brain bleed, seizures, and 2 strokes. We all prepared to say goodbye. Daxton is strong and has angels all around him. With a brain shunt and feeding tube, he is doing remarkably well. And, like your story with Bronson, there is much hope that his brain was not affected as much as the doctors predicted - only time will tell. I am expecting my 3rd child in 2 weeks time. Not sure if it's a boy or a girl. If it's a boy, I will be the mother of three young men. I will look to mothers like you for A LOT of STRENGTH! :) XOXO Merry Christmas! Thanks for the update, I have thought of your family often over the past months. 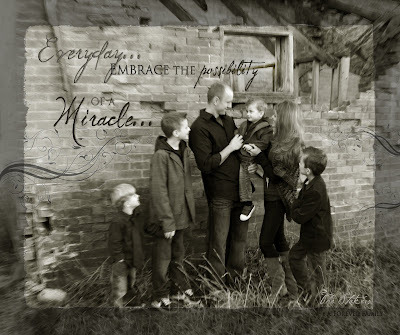 Glad you have been embracing each moment and beautiful Christmas card photos, I believe in miracles. I used to read your blog all the time, I'm so glad you updated! Merry Christmas! so, i am very happy you are THERE, because it is a good place to be. together. however, i keep wishing you were HERE, together, because it's a good place to be, too. big hugs to each of my stakers...much love & feliz navidad!!! Thank you for updating, you are so inspiring and you have such a beautiful family! It is fun reading your posts! I'm glad your blogging again. I love your posts, they are so inspiring! Thanks so much for the post! I've been checking in periodically and was so glad to see that you've decided to blog again! Hope your Christmas was great-have a Happy New Year! And he is a miracle, in deed! Sara, we have not met, but I followed your story along with hundreds and thousands of people. I have been so touched and moved by your story. Hope you the most wonderful year in 2011!!! Your boys are all so handsome and grown up! Can't wait to see your Christmas card! I'll get your number from Jane and text my address to you. Can't figure out how to send it over the internet without a million people having access to it! :) Merry, Merry Christmas! Welcome back! It was so great to have lunch together last week. Even though we are shameful photographers and forgot to take a picture, again. I love the Christmas card and smile each time I look at the boys sleeping, thinking about all the time it took to get just the right shot (thank you, Photoshop!) Love you!